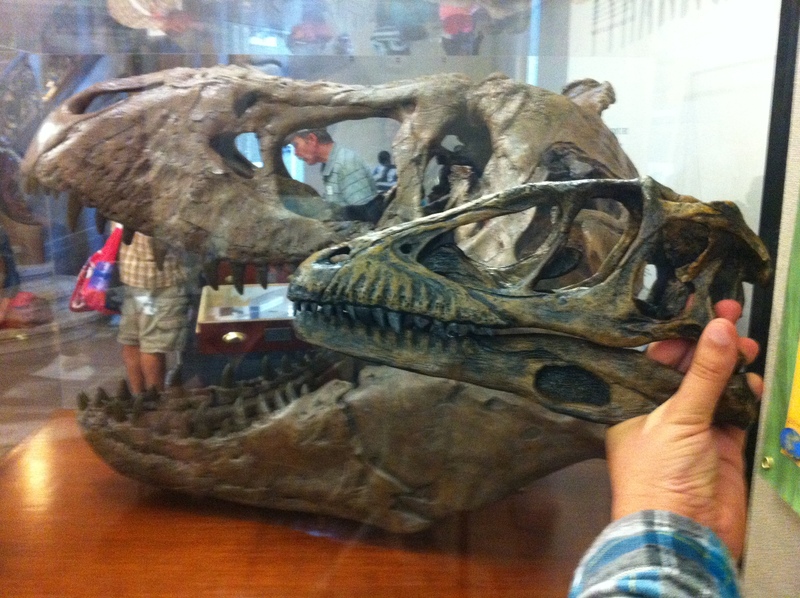 Happy National Fossil Day! 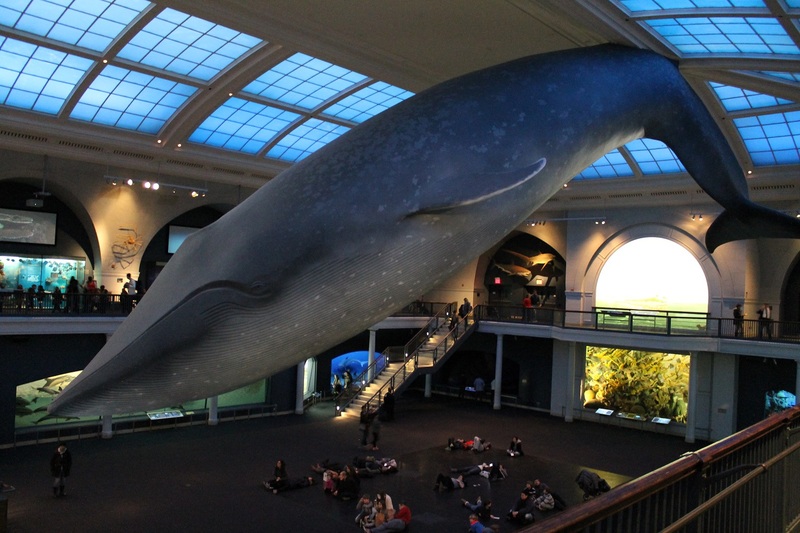 This will just be a quick photo post covering the events at the National Museum of Natural History today. 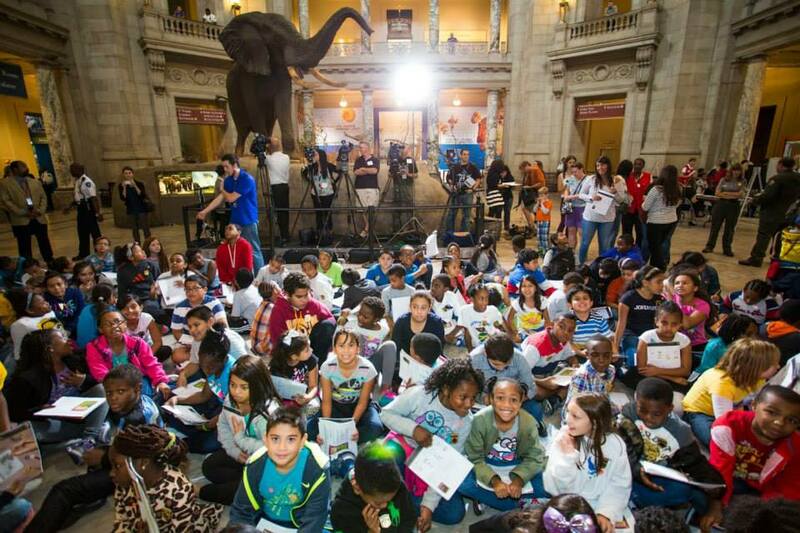 The National Park Service started the day with a junior paleontologist swearing-in ceremony, where students from a dozen area schools learned about the importance of protecting and preserving public lands and natural resources. Photo by the National Park Service. The main show was in the Q?rius education center, where museum staff and volunteers showed off their latest work and discoveries. Visitors could see tiny mammal bones and teeth plucked from matrix collected in Haitian caves, and work through a particularly inspired activity demonstrating how geologists correlate layers in different parts of the world. 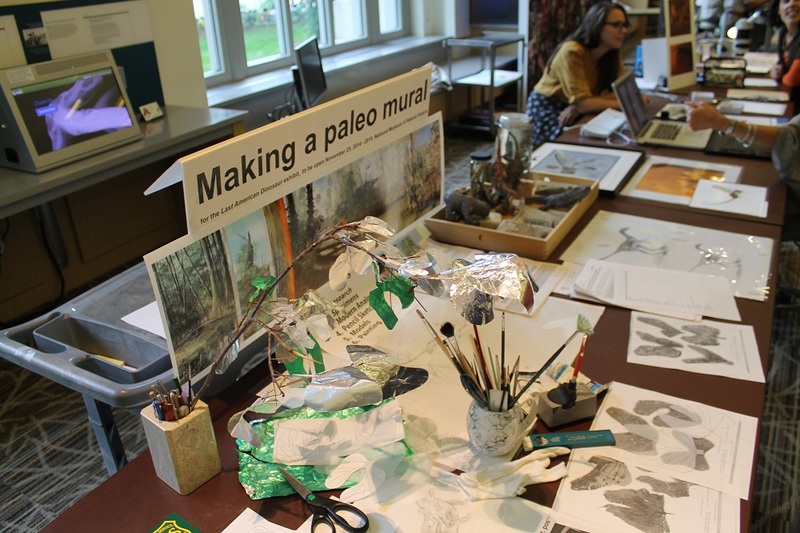 Resident scientific illustrator Mary Parrish had a particularly fascinating display, showcasing the methods and materials she uses to create accurate paintings of prehistoric environments. Note the aluminum foil leaves used as models to paint from, as well as the hand-made macquettes used to block out scenes and experiment with poses. Also on view was a draft of the giant Hell Creek mural that will be on display in The Last American Dinosaurs, opening in November. Out in the lower level lobby, the National Park Service, Bureau of Land Management, US Forest Service, National Science Foundation, Calvert Marine Museum, and Maryland Dinosaur Park had activities and displays. Here’s our display of recently discovered fossils from Cretaceous Maryland, slightly overshadowed by the Nation’s T. rex. 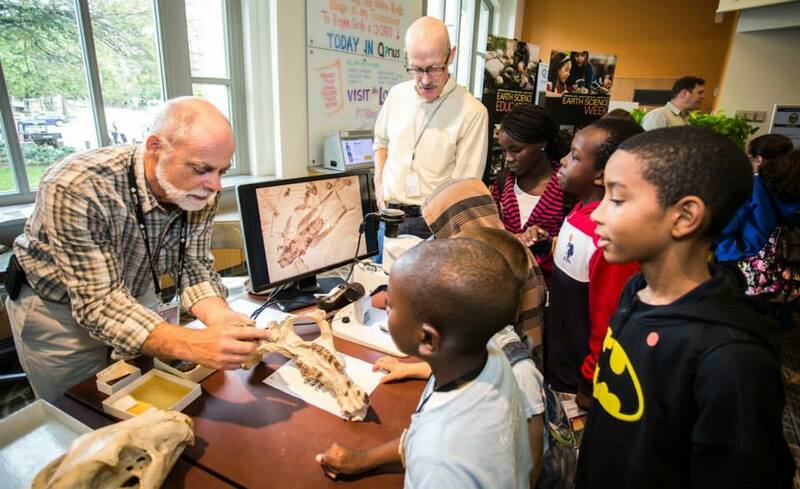 We talked with visitors about Maryland’s role in the history of dinosaur science, the importance of the early Cretaceous as the origin of the world we know today, and our citizen science programs at the Park in Laurel. 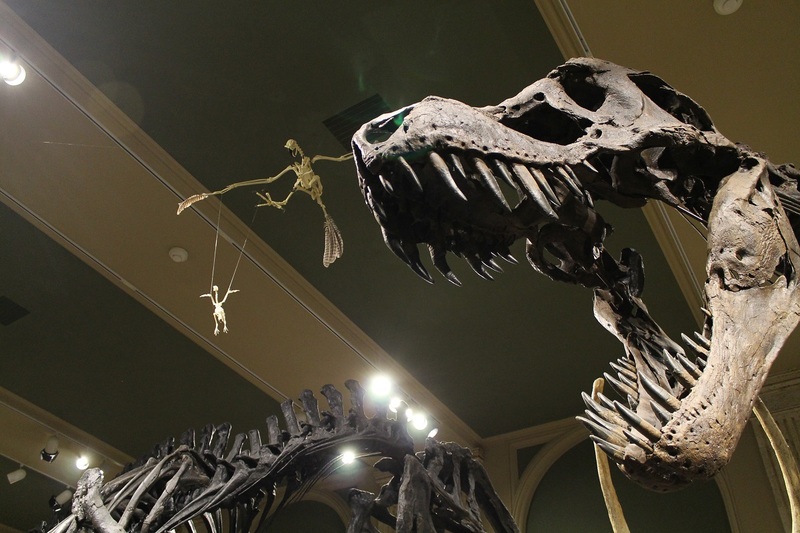 Our Deinonychus replica looks a little small next to the Nation’s T. rex. Photo by the author. 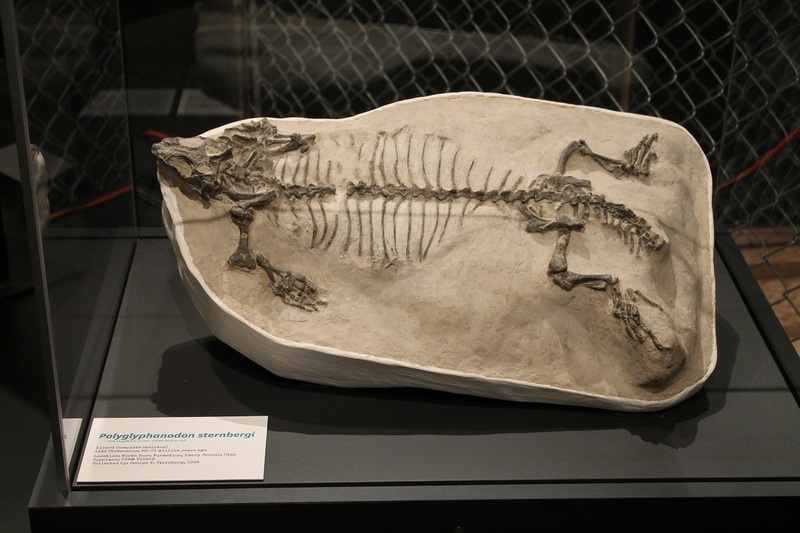 National Fossil Day is all about generating awareness and enthusiasm for fossils and the study of the Earth’s natural history. In that, I think the event was quite successful. 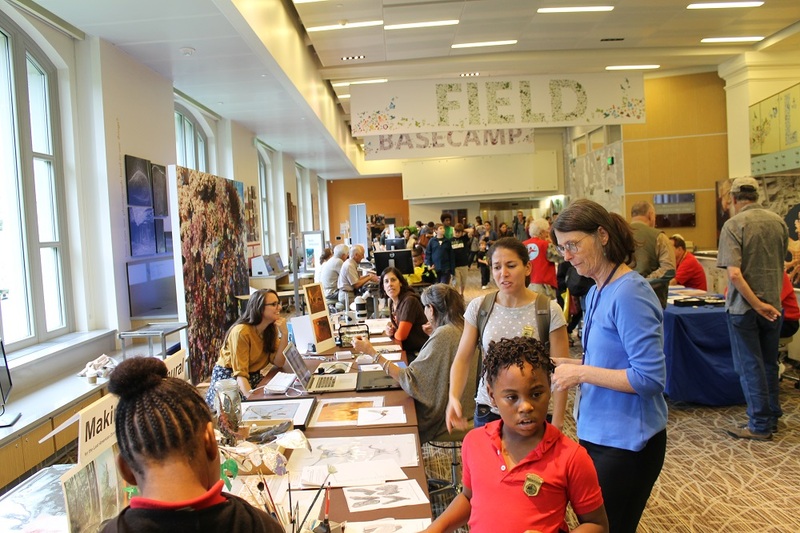 We talked to nearly 400 people, all of them enthusiastic and eager to learn about local prehistory and the process of discovering the ancient past. 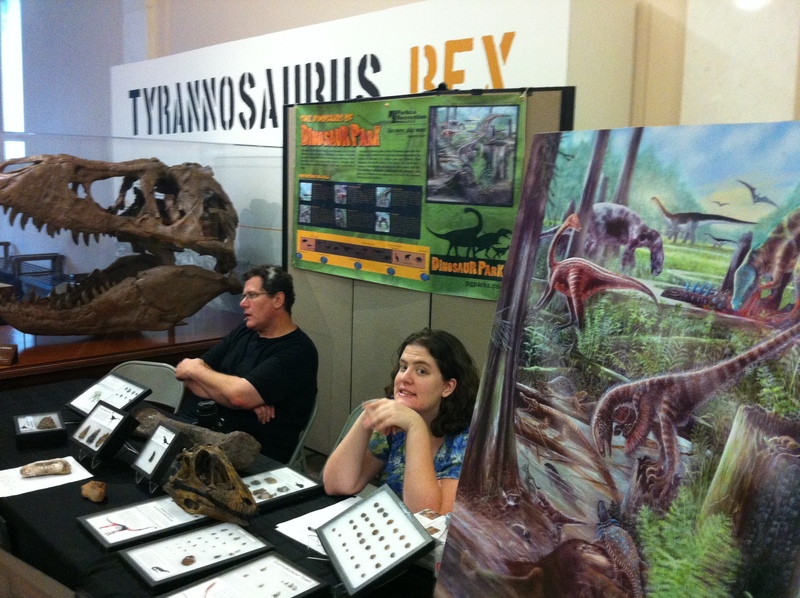 It was also a fun opportunity to catch up with people – the Washington area paleontology scene isn’t very big! Thank you to the National Park Service for coordinating this event, and to the Smithsonian for hosting it! 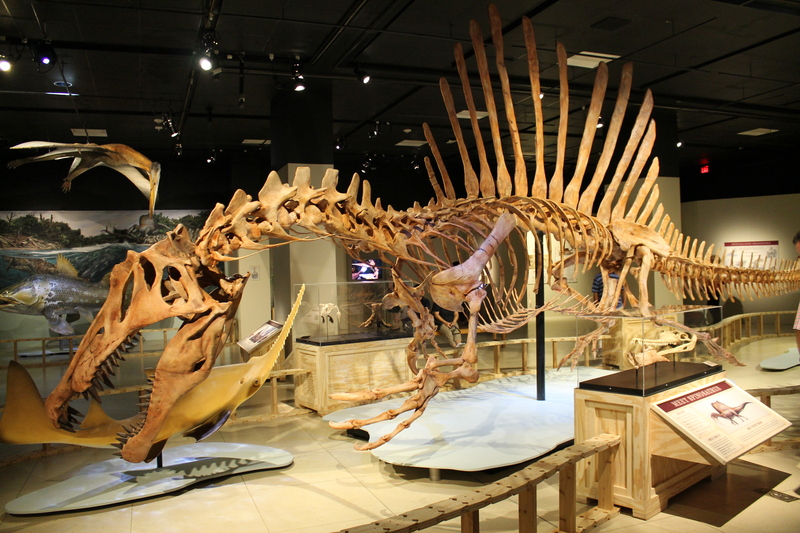 Research Casting International has done it again with a beautiful reconstructed skeleton of a swimming Spinosaurus. Photo by the author. Yesterday, Nizar Ibrahim and National Geographic made a tremendous splash with their long-awaited announcement of a new Spinosaurus specimen. Spinosaurus is a widely recognized and beloved dinosaur (particularly among what one might call the dinosaur fandom community), but paradoxically it is known from only the scrappiest of fossil remains. 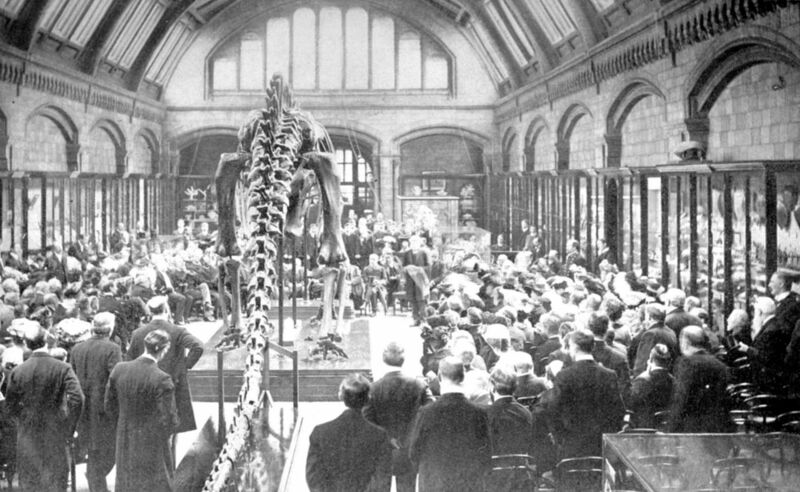 What’s more, the holotype specimen is long gone – destroyed in the bombing of Munich during World War II. No doubt the enigmatic nature of Spinosaurus is a major part of its appeal. At any rate, the new paper by Ibrahim and colleagues describes the never-before-seen hindlimbs and pelvis of Spinosaurus, and proposes that the dinosaur’s anatomy – and behavior – were far more extreme than previously assumed. 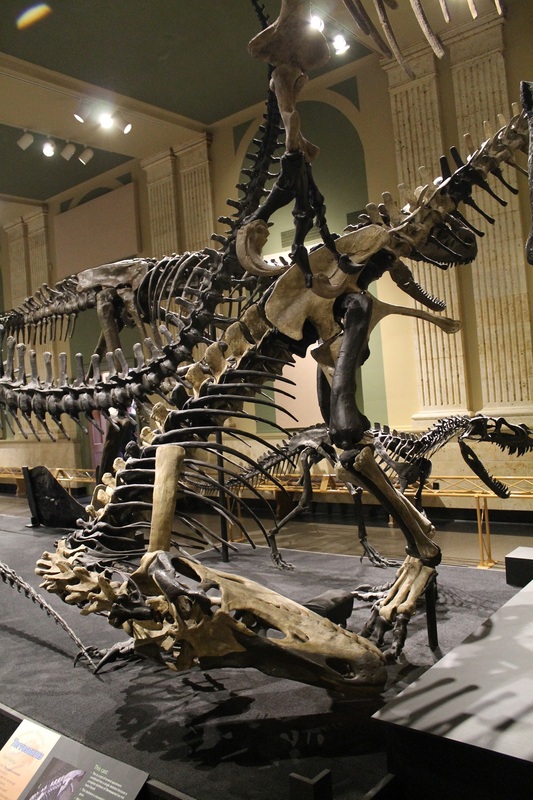 The new specimen reveals that Spinosaurus had narrow hips and legs barely longer than its arms. This was not an animal built for running on land, and a quadrupedal posture is not out of the question. What’s more, Spinosaurus limb bones are surprisingly dense for a theropod, not unlike the heavy bones of seals and early whales. Ibrahim and colleagues paint a picture of Spinosaurus as an animal that was at least as at-home in the water as it was on land. 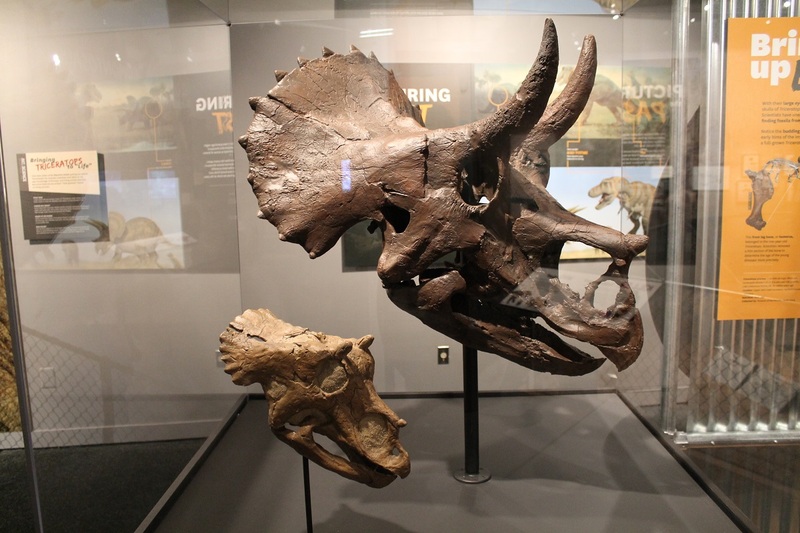 The news has provoked the usual cycle of rampant speculation among dino fans, dismissal of sensationalism by some professionals, and even well-reasoned, evidence-based criticism. After the fervor dies down, we can assess whether this hypothesis holds water. In the meantime, though, I must applaud the tremendously impressive show National Geographic has put on. 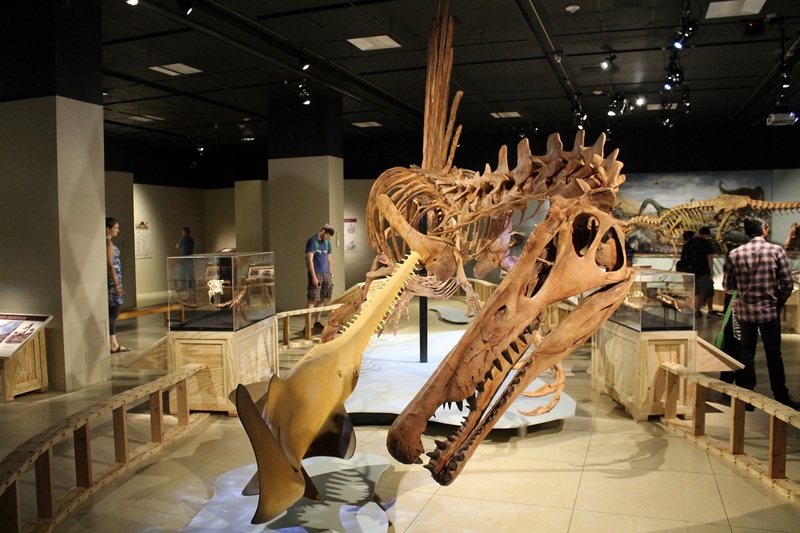 As part of the media roll-out that started yesterday afternoon, National Geographic has prepared both a television special and a traveling exhibit revolving around Spinosaurus. Some might scoff at all the hype over a partial skeleton, but I’d call this science outreach at its best, put on by some of the most experienced folks in the business. 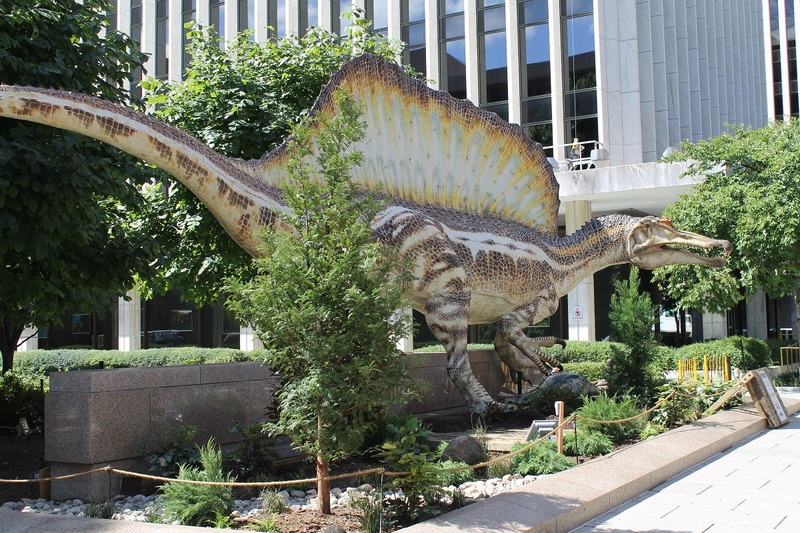 This Spinosaurus sculpture will be a fixture outside the National Geographic Building on 17th street until January. Photo by the author. “Spinosaurus: Lost Giant of the Cretaceous” opened this morning at the National Geographic Explorer’s Hall in Washington, DC, and in this post I’d like to share my initial impressions. Visitors approaching from M Street are greeted by a life-sized Spinosaurus sculpture, posed over a half-eaten fish. This superb model was produced by the Italian studio GeoModel, and was apparently over a year in the making. Conceptual art and behind-the-scenes photos can be seen here. I’m not sure if the model has quite the extreme proportions that are proposed in the paper, but it’s not like I actually measured it. Regardless, this is a stunning piece that will be a DC fixture through the end of the year. The shrine to Ernst Stromer at the exhibit’s entrance. Photo by the author. Once you’ve gone inside and paid your admission (I remember when this museum was free…oh well), you can enter the Spinosaurus exhibit proper. 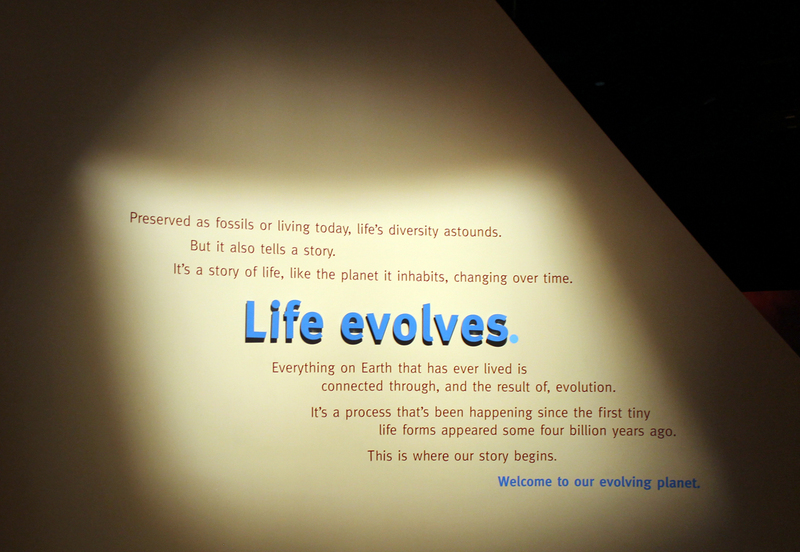 Interestingly, the exhibit is framed not as a science lesson but as a historical account. 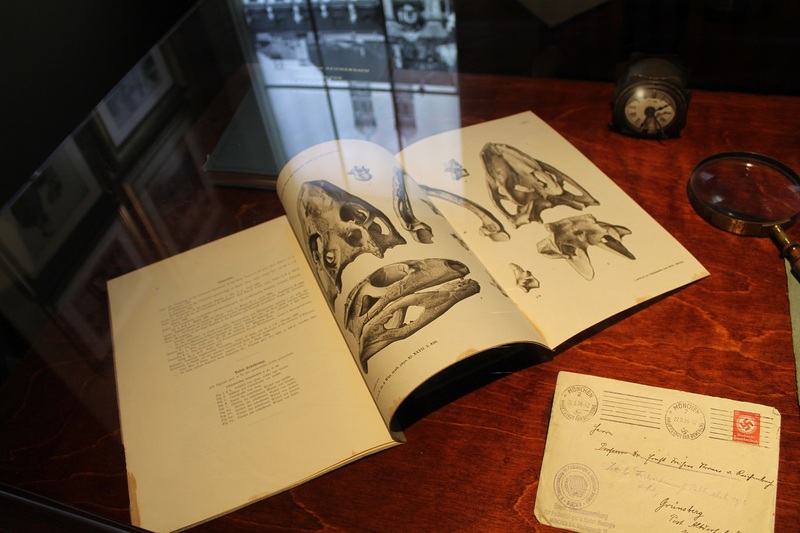 The first objects on display are documents and other possessions of Ernst Stromer, the German paleontologist who originally described Spinosaurus in 1915. 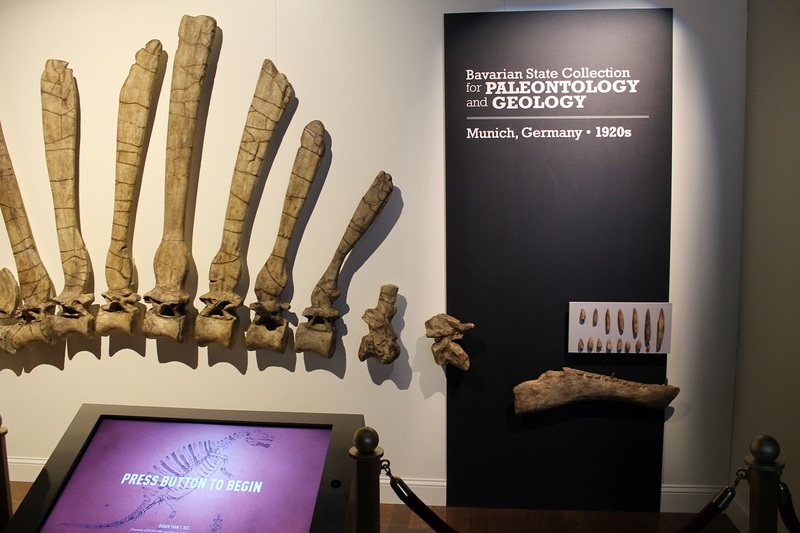 Passing through a narrow corridor, you’ll see a reconstruction of the Spinosaurus holotype as it was displayed at the Bavarian State Collection in Munich, a Moroccan fossil shop, and even a replica of the cave where a Mysterious Bedouin Stranger led Ibrahim to the new find. Each stop is supplemented by a video mixing talking-head interviews with somewhat silly re-enactments of historic events. I particularly liked Stromer being berated by his Nazi boss. I never dreamed I’d ever see an exact reconstruction of the Spinosaurus holotype, which was destroyed during World War II. Photo by the author. I thought this method of storytelling was quite clever. 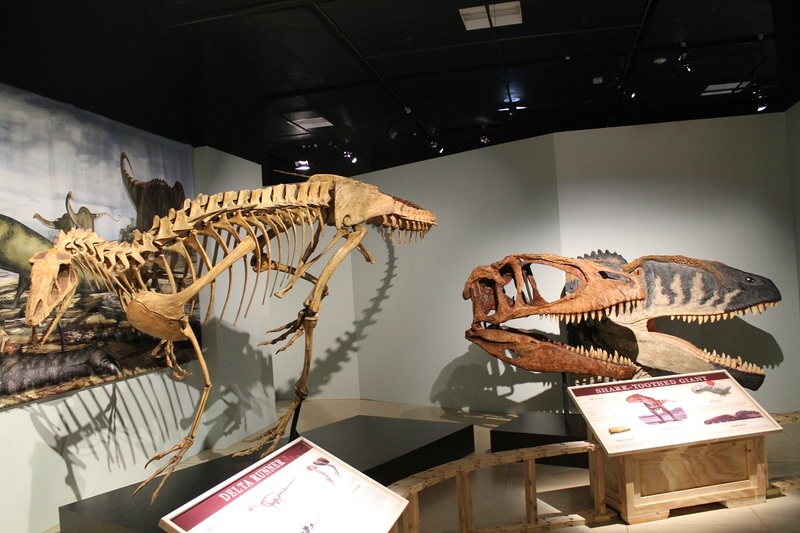 By focusing on the role of Spinosaurus in world history, the exhibit can grab the attention of adult visitors that would usually dismiss dinosaurs as kids’ stuff. National Geographic’s shtick has always been presenting stories of intrepid scientists on adventures in distant locales, and there is plenty of that in evidence here. This sort of exoticism is probably a little problematic, but the gorgeous images of the Moroccan desert were clearly having the desired effect on some of my fellow visitors. Usually, I would complain about the over-reliance on long videos, but people seemed to be watching them all the way to the end, so I guess I’ll keep quiet this time. Spinosaurus in all its glory. Photo by the author. 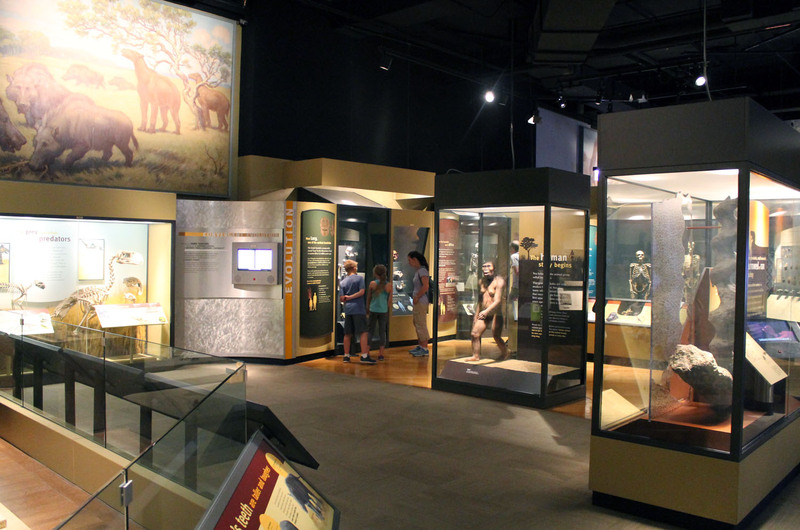 Once the history lesson is over, the exhibit opens up into a larger display space. 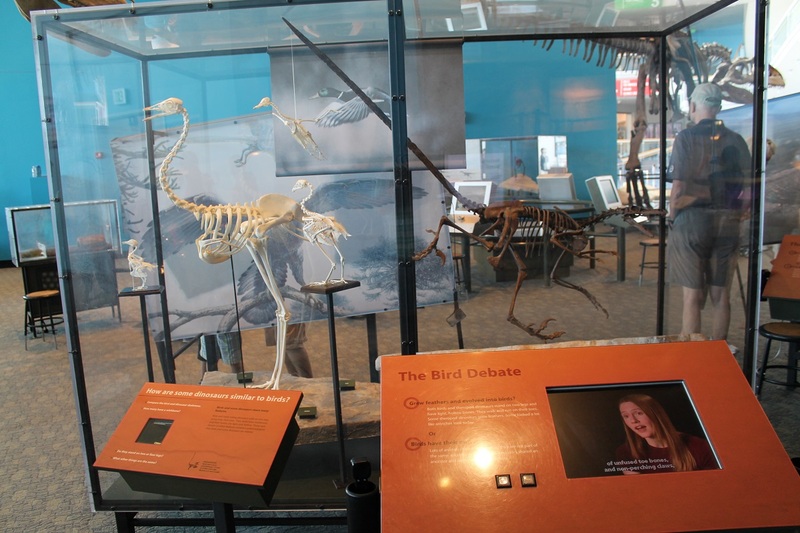 This is similar to what was done in “The World’s Largest Dinosaurs” – a narrow entry gallery introduces visitors to the topic at hand and the central questions being discussed, then visitors are freed to look at what they find interesting in whatever order they choose. 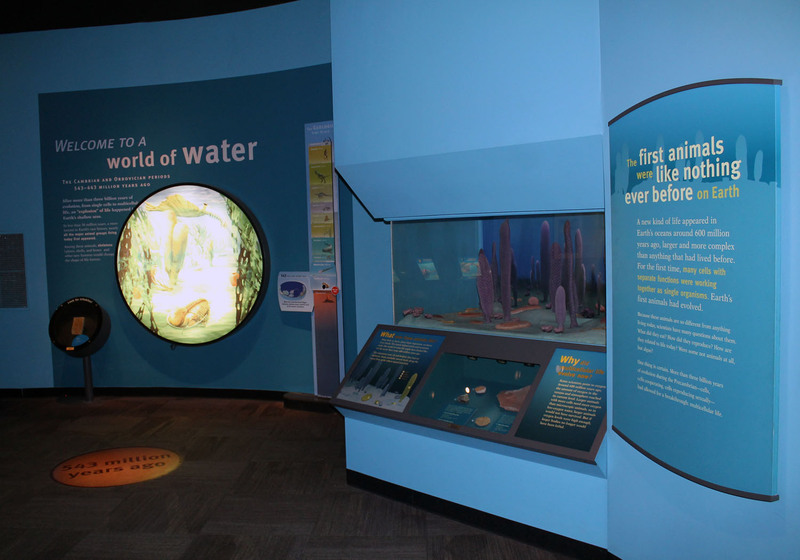 All in all, this layout is a good compromise between the need to convey a specific educational message and the need to let visitors make the exhibit experience their own. The star of the show is of course the reconstructed skeleton of Spinosaurus, yet another fantastic display piece by Research Casting International. Check out a time-lapse video of the mount being assembled here. What wasn’t clear from the grainy preview images that were flying around the internet a couple months ago is that the Spinosaurus is actually in a swimming pose. Its legs are posed in mid-paddle, and its head is turned to the right to snag a model sawfish. Above all, the mount is big. So big, in fact, that I couldn’t find anywhere in the gallery where I could photograph it all at once. I’d love to see this thing alongside Sue. 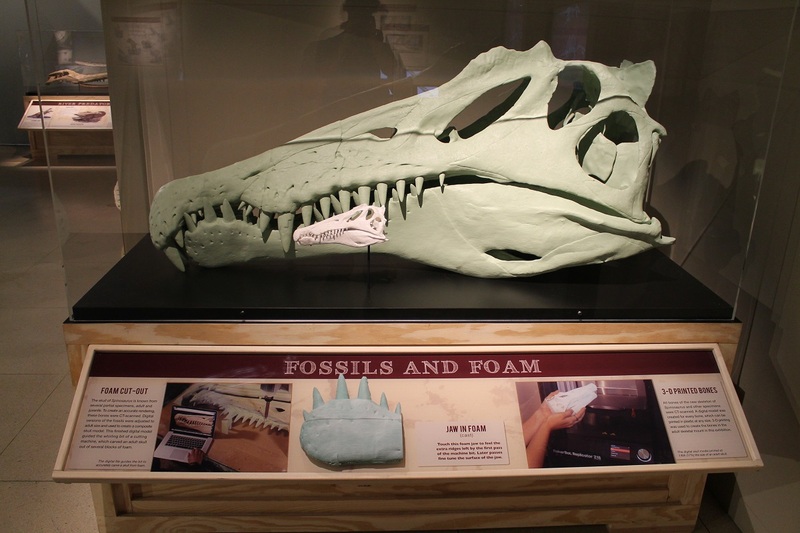 The process of 3D printing digital fossils, explained. Photo by the author. Happily, the exhibit takes the time to acknowledge that the Spinosaurus mount is not only a cast, but a composite of many fossil specimens. 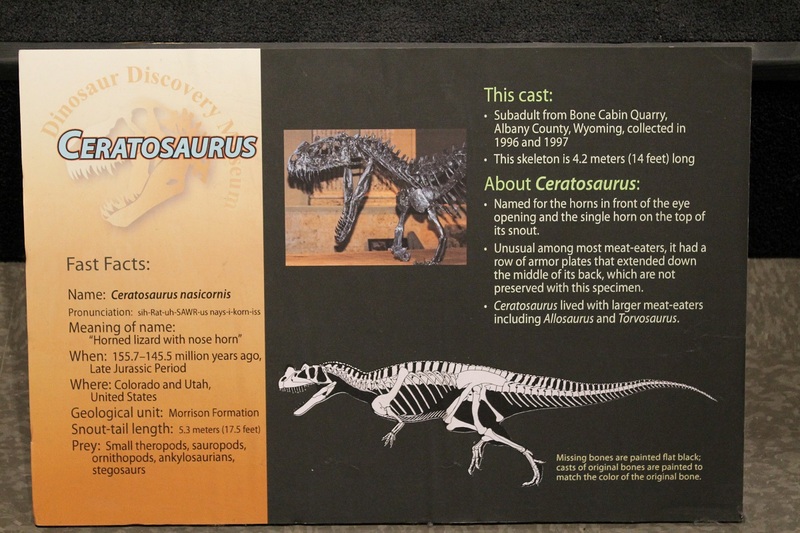 There is even a small display showcasing the process by which fossils are scanned and 3-D printed at a consistent scale. 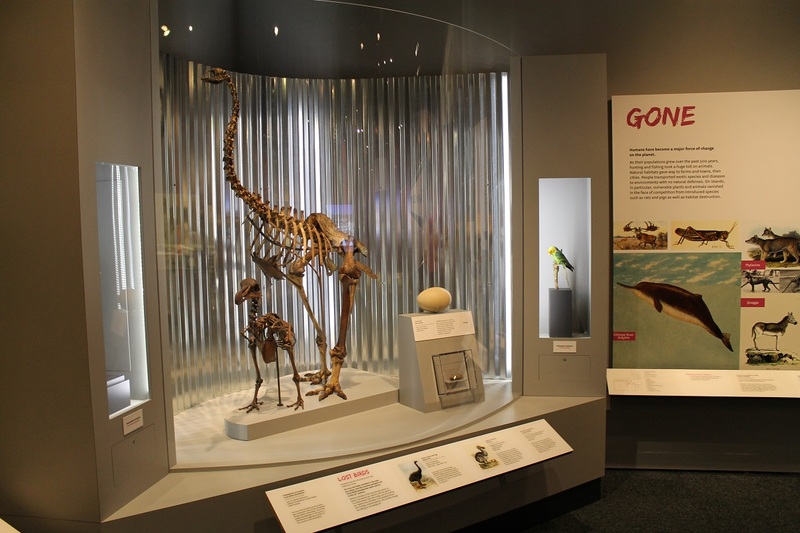 It’s great that the exhibit explains the evidence that led to the aquatic Spinosaurus reconstruction, showcasing the process of making and testing a scientific hypothesis. 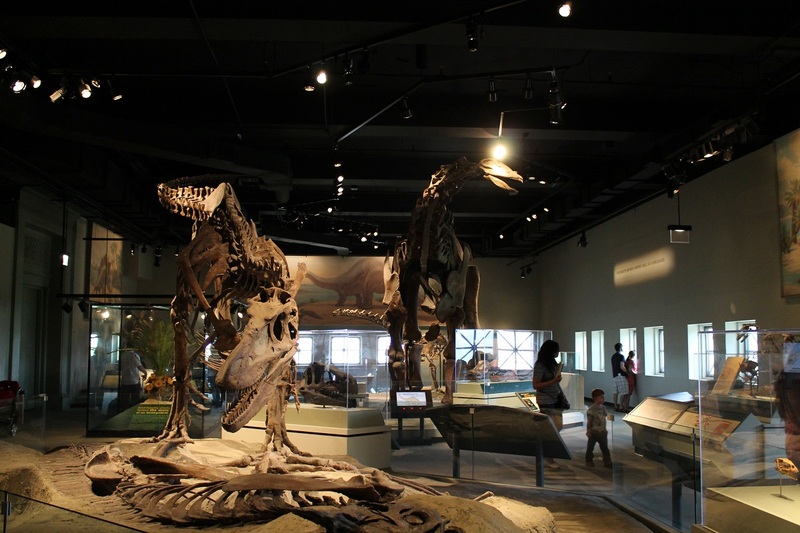 Around the perimeter of the Spinosaurus gallery are displays of the other paleofauna of the Kem Kem region in Morocco, which Paul Sereno and company have been assembling for many years. 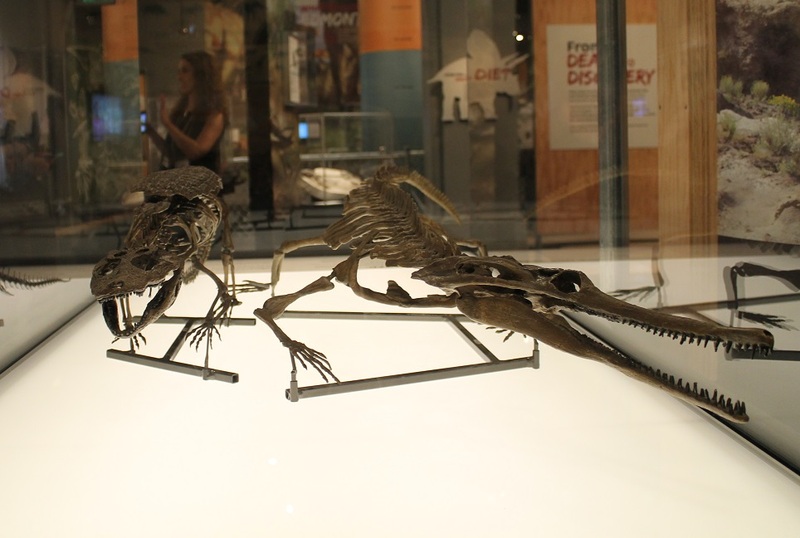 There are models of azdarchid pterosaurs and coelocanth fish, as well as a Deltadromeus skeleton and skulls of Carcharodontosaurus and Rugops (all heavily-reconstructed casts). 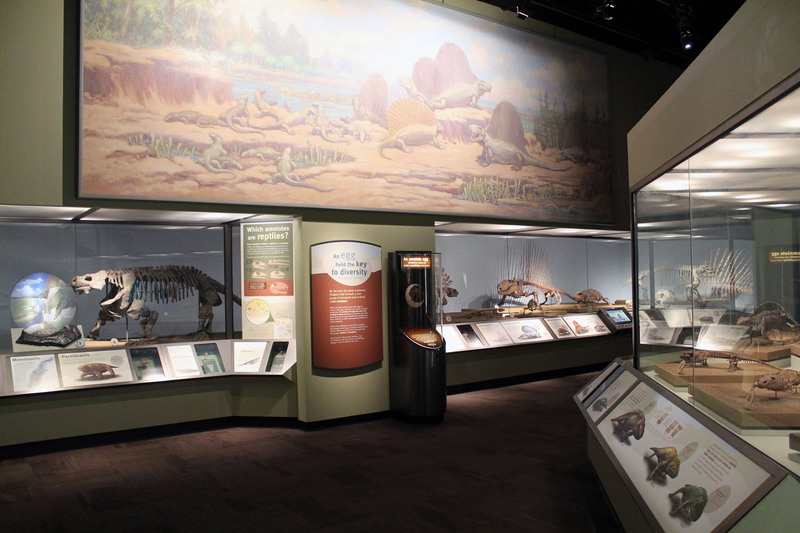 All of these displays explore the question of how so many carnivores could co-exist in one environment. The answer provided is that each predator was specialized to hunt a different kind of prey: Spinosaurus chased fish, Carcharodontosaurus ate big herbivorous dinosaurs and (this will undoubtedly annoy some) Rugops is presented as an obligate scavenger. Some Kem Kem friends: Deltadromeus and Carcharodontosaurus. Photo by the author. I have virtually nothing negative to say about the Spinosaurus exhibit. This is a great story, well told, and I was thoroughly impressed by nearly every part of it. 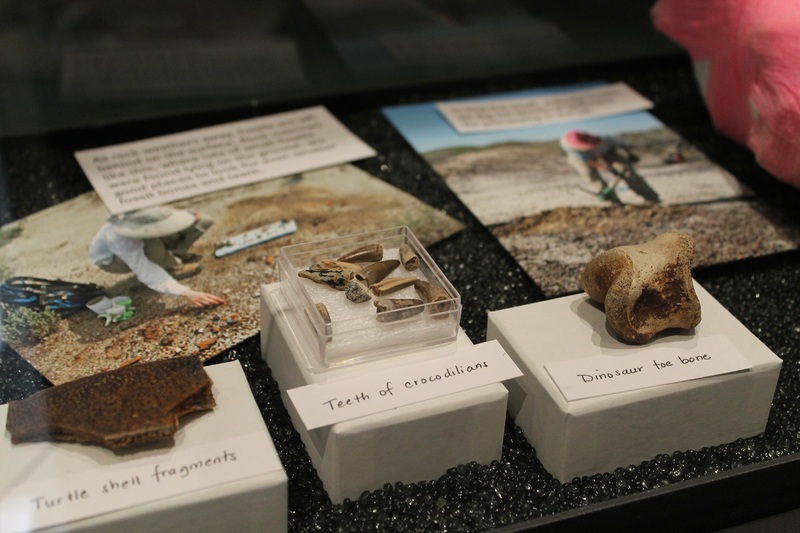 The only thing that might be a sore point for some is that there are very few authentic fossils on display. A single dorsal spine is the only real bone representing Spinosaurus. 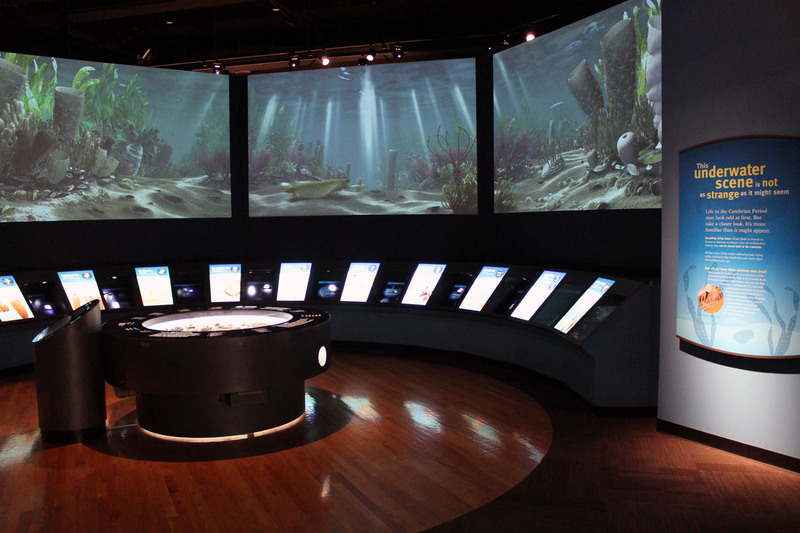 Nevertheless, the exhibit team has shown precisely how to dramatize the process of scientific discovery, while still making the process transparent and relateable. Bravo. First, let me assure you that the posts on major fossil exhibits and Triceratops mounts I’ve promised are definitely in the works, and I should be finishing them soon(ish). 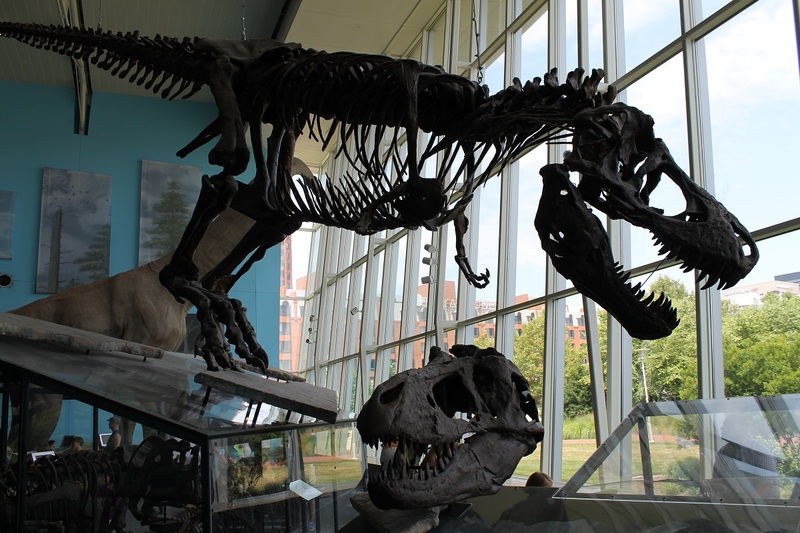 In the meantime, here’s a quick write-up of my recent trek to the distant land of Baltimore’s inner harbor, home of the Maryland Science Center and the “Dinosaur Mysteries” exhibit. In all seriousness, this exhibit has been open since 2004 and is less than 40 miles from me, so this visit was long overdue. 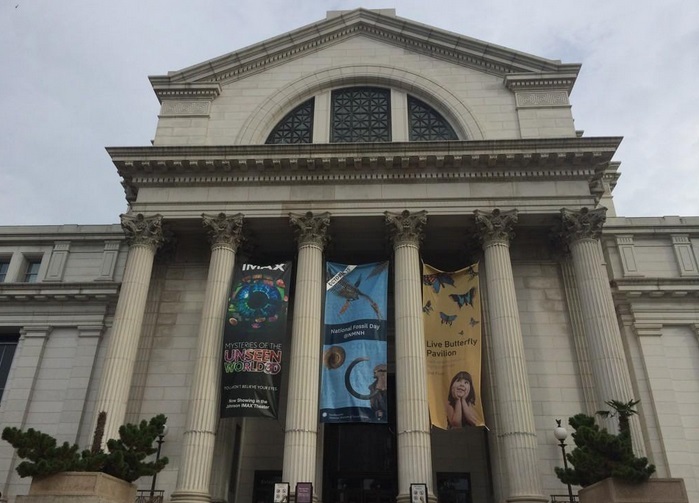 What’s more, now that the Smithsonian’s fossil hall is closed for renovation, this is the largest dinosaur exhibit in the region, and will be the spot to see mounted dinosaur skeletons near Washington, D.C. for the next five years. Is it up to the task? Let’s find out. Dinosaur Mysteries from the second floor. Photo by the author. 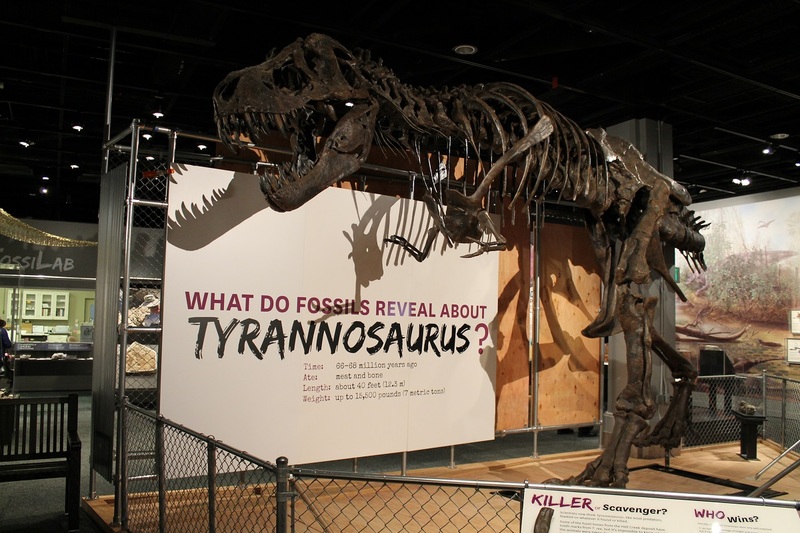 At 15,000 square feet, Dinosaur Mysteries isn’t a huge exhibit, but it’s pretty dense with content. 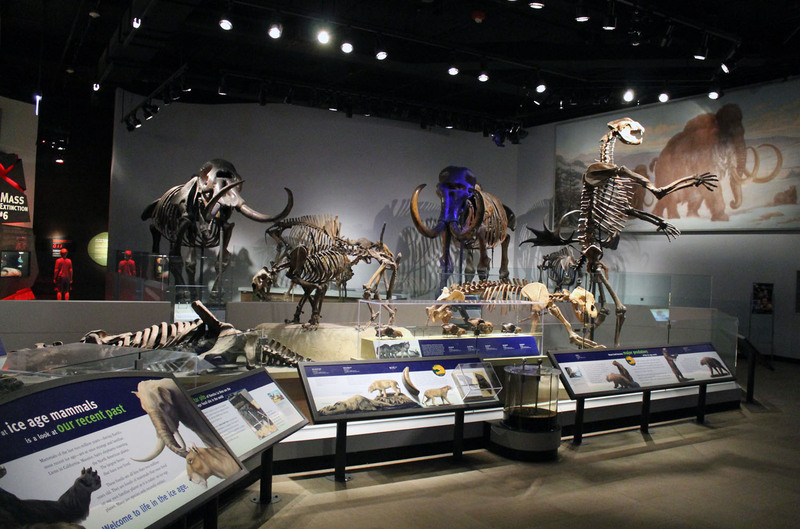 There are a lot of displays and interactives crammed into into the space, including no less than 12 free-standing mounts and life-sized sculptures of Astrodon* and Acrocanthosaurus. 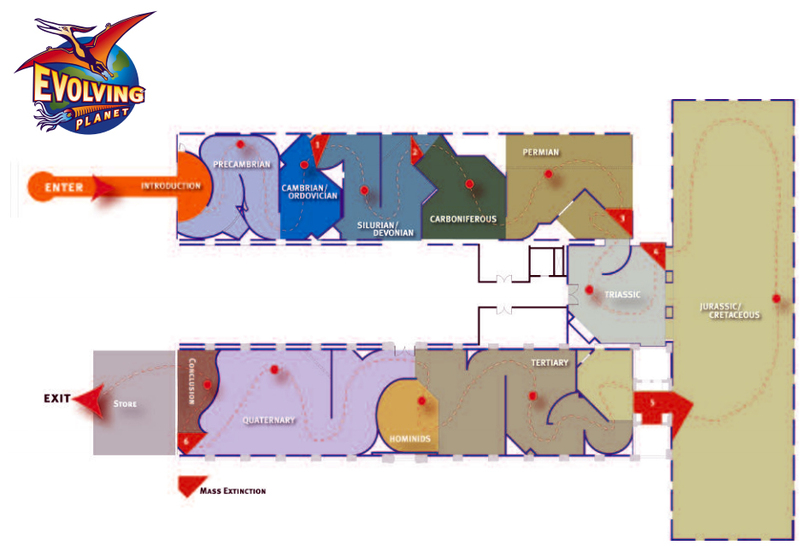 This venue is a science center, not a natural history museum, so the exhibit is mostly aimed at kids and families. That said, there’s still plenty for adult visitors to enjoy (the rest of the museum is purely for kids, though…if you don’t have any, I’d recommend taking advantage of the half-priced Friday evenings). 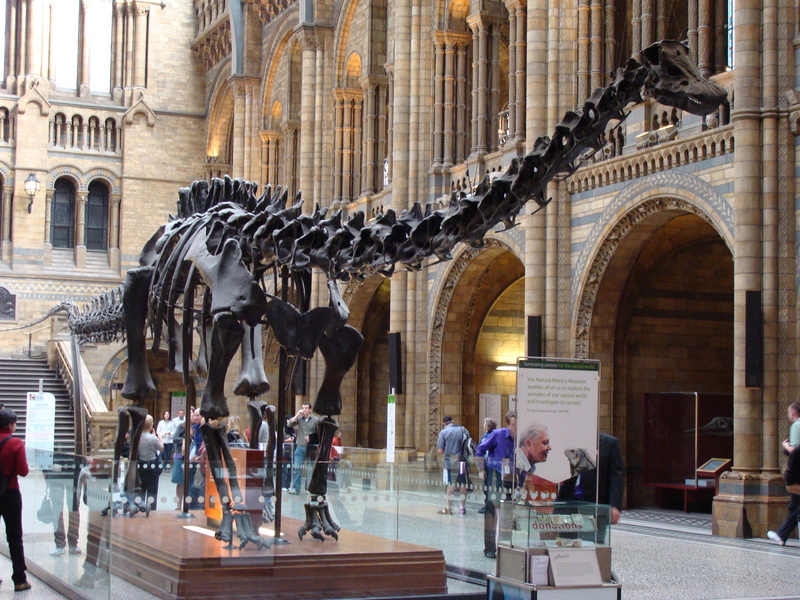 *Alright, it’s really a sculpture of Giraffatitan standing in for the poorly known Astrodon. 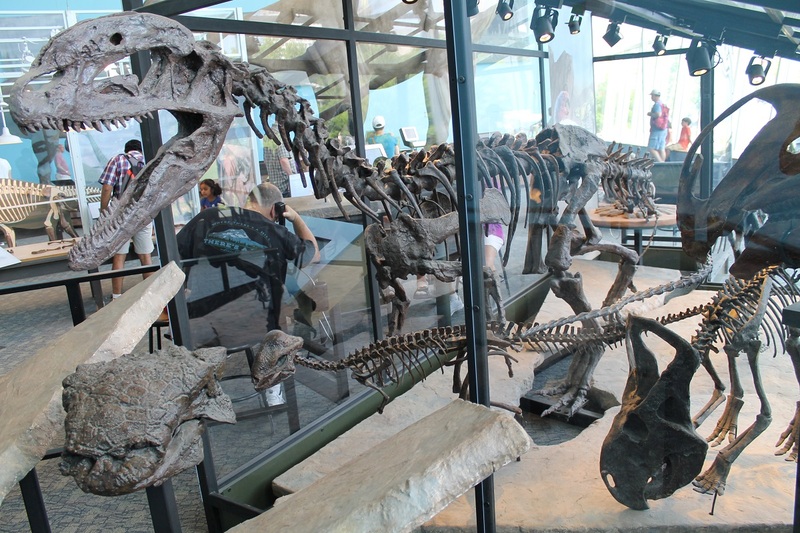 Among the mounted skeletons (all casts), expect to see Tyrannosaurus (Peck’s Rex, to be specific), Tarbosaurus, Giganotosaurus, Compsognathus, Herrerasaurus, Protoceratops, what used to be called “Dilophosaurus sinensis”, and plenty of others. The offerings are a little theropod heavy (and a little tyrannosaur heavy, in point of fact), but they certainly don’t fail to impress. 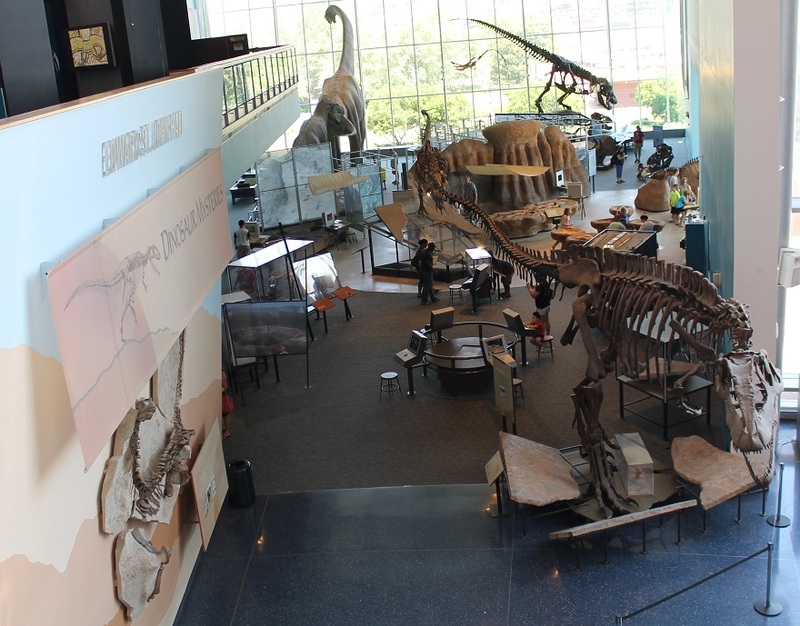 Sadly overlooked by most visitors are some lovely genuine Maryland fossils, including an Astrodon femur that is the largest dinosaur bone found east of the Mississippi River. 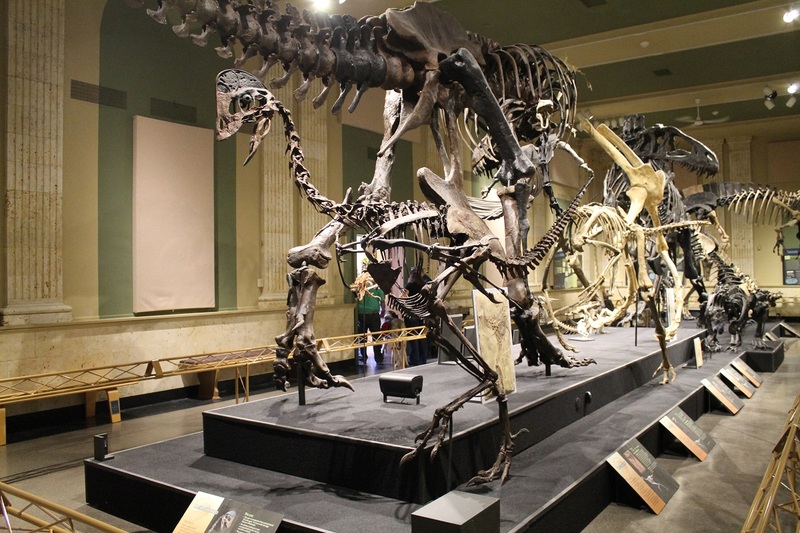 Full skeleton cast of Peck’s Rex, accompanied by skull cast of the Nation’s T. rex/Wankel Rex. Photo by the author. Thematically, Dinosaur Mysteries is all about answering questions through observation and deduction. 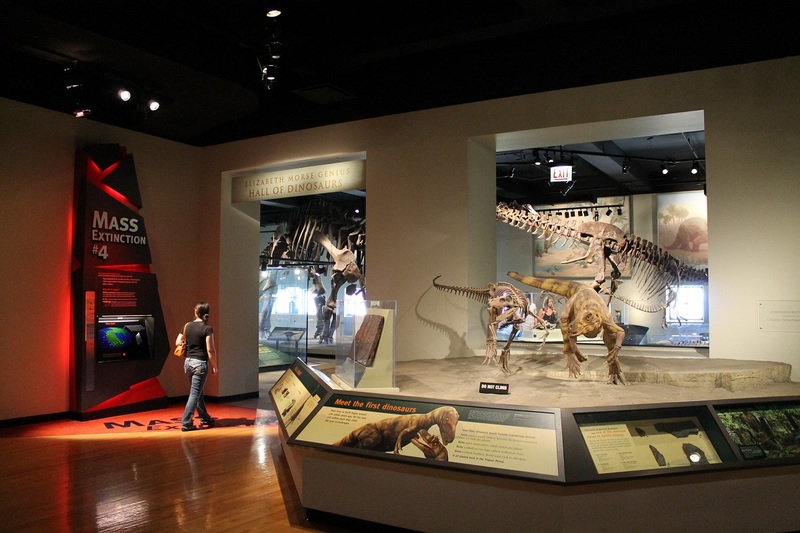 The press release asserts that there are over two dozen interactives available, and indeed, visitors are invited throughout the exhibit to compare, contrast, and even measure fossils in order to draw conclusions about dinosaurs’ lives. Most of the “mysteries” are of the safe variety, tackling issues that are either soundly resolved or were never really issues to begin with (think “are birds dinosaurs” or “was Tyrannosaurus a scavenger or a predator”). Experts might be a bit blasé about these questions, but they nevertheless serve to get visitors thinking about how scientists draw conclusions. I go back and forth on this, but generally I find it helpful to embrace what visitors are already familiar with, at least as a starting point, rather than shutting out their frame of reference entirely. This may come as a shock, but birds are dinosaurs. Photo by the author. Other interactive components include a cool champsosaur skeleton puzzle, and a tabletop sandbox to dig in. I would have liked to see more interactivity with the dinosaur mounts themselves, since they’re the most visually impressive part of the exhibit. 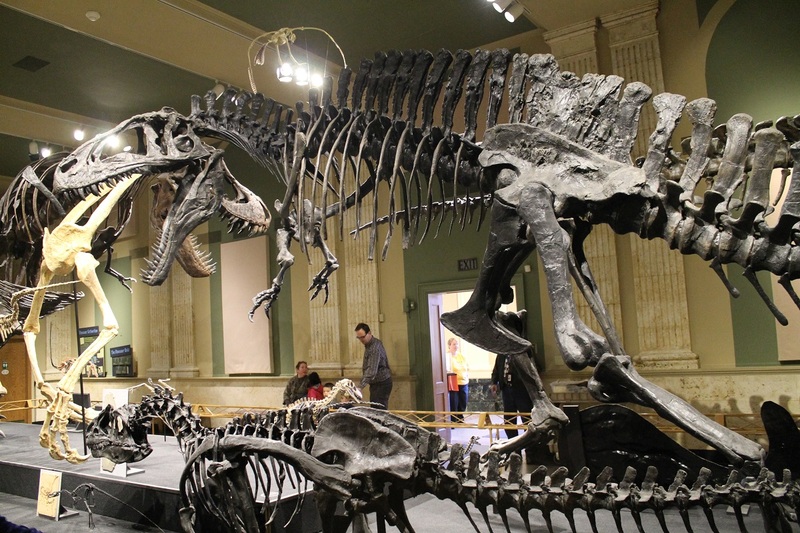 For example, there are no less than three Tyrannosaurus skulls on display, all from different specimens. That’s a great opportunity to compare the eccentricities of each individual, perhaps considering age differences, sexual dimorphism, pathology, or even erroneous reconstruction (looking at you, Wankel Rex rostrum). 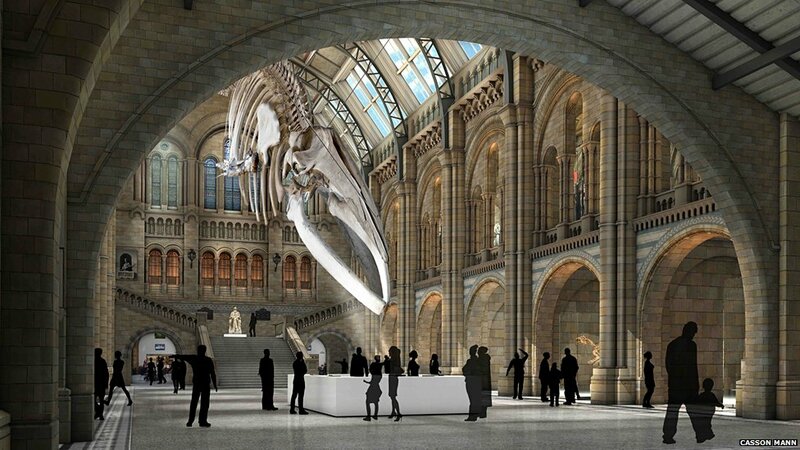 With some guidance, I reckon most visitors would do well with that, and it would push them closer to how paleontologists actually study fossils. 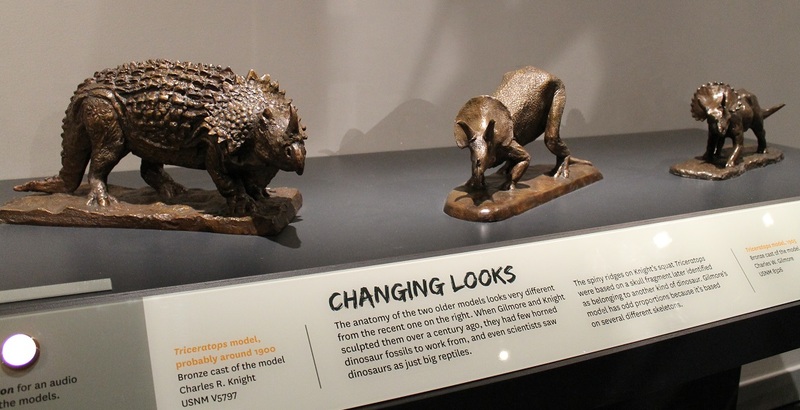 Astrodon and Acrocanthosaurus sculptures, with a Bored Dad. Photo by the author. Apparently included in those two dozen interactives are a number of video terminals. As I’ve ranted before, videos are not interactive, even if you get to press a button to start it. That said, I’m actually of two minds about these. The videos, which are mostly interviews with paleontologists like Tom Holtz, Kristina Curry-Rogers, and Chris Morrow, were fascinating. 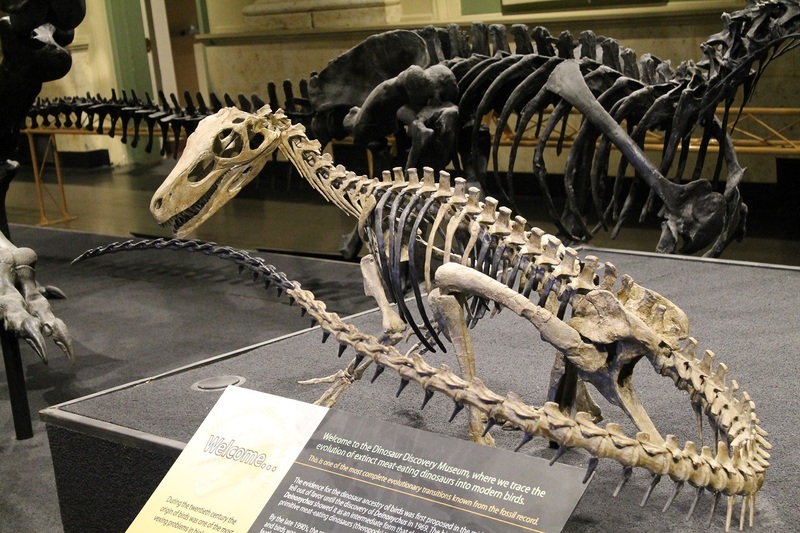 I enjoyed hearing about the presumed purpose of Tyrannosaurus gastralia, what can and cannot be presumed from dinosaur trackways, and especially the decision-making process behind posing a T. rex mount. However, these videos are also quite long, and rather unedited. The speakers ramble, repeat themselves, and generally er and um through their spiels. It’s quite a bit like chatting with a scientist about their work in person, actually, and I’m always in favor of giving science a human face. On the other hand, the exhibit team probably could have tightened these up. What used to be called “Dilophosaurus sinensis” and friends. Photo by the author. Overall, I was pretty pleased with Dinosaur Mysteries. It’s not a large-scale fossil hall at a major research museum, but it’s still cool to experience and the science being taught is generally very good. 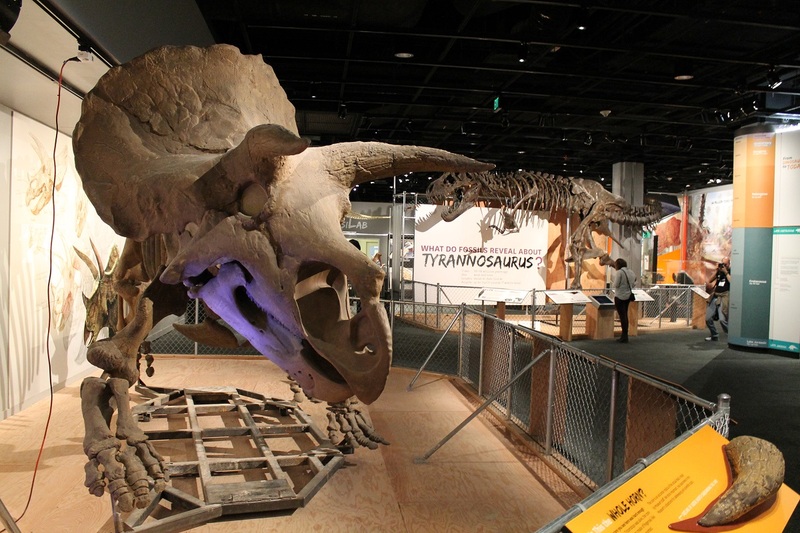 If you’ve got kids who are bummed that the Smithsonian fossil hall is closed (don’t forget that The Last American Dinosaurs is opening this fall, though), this is definitely a worthy substitute. 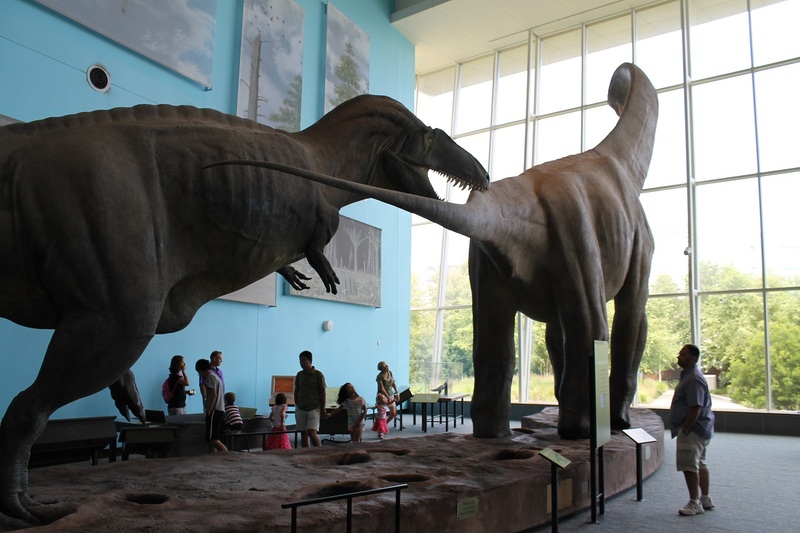 For adults, keep in mind that you aren’t the Maryland Science Center’s target audience, but if you appreciate the artistry of a well-made dinosaur exhibit, Dinosaur Mysteries is still worth checking out. PS: There are a few additional photos on my tumblr page.